Let’s just take a minute to cast our minds back to Wednesday. The sun was shining, there was a light breeze in the air and a feeling of calm on my normally stressful commute. Every one was digging the weather. 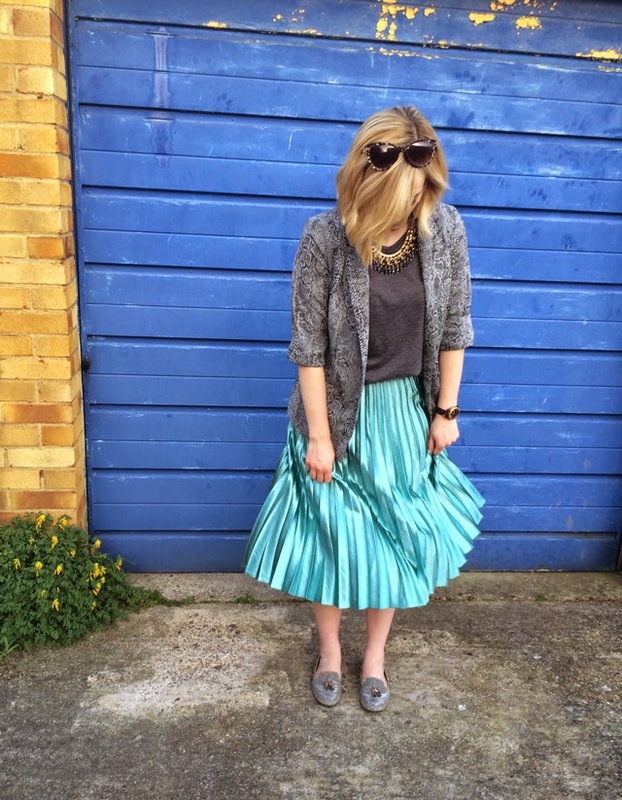 So much so, that I deemed it only appropriate to bust out my metallic teal pleated midi skirt and rock a bit of shimmer and a bit of leg. That’s right. I unleashed my inner Ariel and channelled a mermaid for the day. I originally bought this skirt around the end of last year and wore it to my work Christmas party but I knew it’d be one I could wear again and again, no matter the occasion. This time, I paired it with a plain grey sleeveless top, snake print blazer, and a statement necklace, not forgetting to mention my silver sparkly slipper shoes. Previous Post Does This Dress Mean I’m Growing Up?